Corn field and blue sky photo by Lars Plougmann on Flickr (use permitted with attribution / share alike). 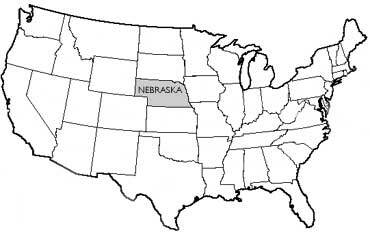 Nebraska's nickname is "The Cornhusker State." Early explorers considered Nebraska and the surrounding areas part of the great American desert. In the 1860's the first wave of homesteaders poured into Nebraska to claim free land granted by the federal government. Many of these first Nebraskan settlers built their homes out of sod because trees were sparse on the grassy land. Much history of the state is the story of these rugged, strong-willed Nebraska farmers who fought hardship, draught, and insects to transform the desert into ranches and farms. 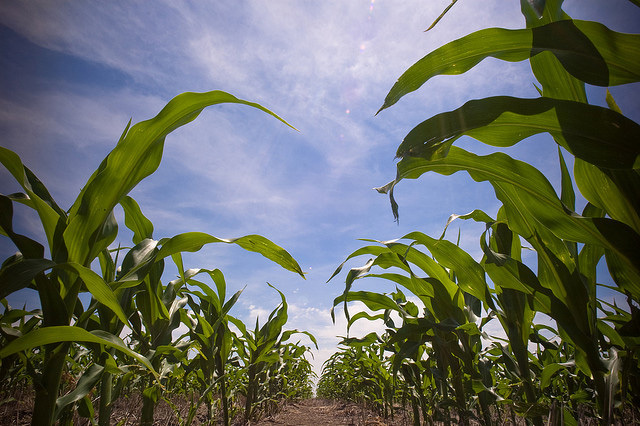 Today Nebraska is a leading agricultural state, considered a bread basket for the USA and much of the world. Nebraska legislature originally designated "Tree Planter's State" as the official nickname in 1895 (Arbor Day was founded in 1872 by J. Sterling Morton of Nebraska City, Nevadan U.S. Senator Phineas W. Hitchcock introduced the Timber Culture Act in 1873, and millions of trees were planted by early settlers of Nevada as windbreaks, woodlots, and orchards). In 1945 the original act was repealed and the "Cornhusker State" became the official nickname of Nebraska (derived from the nickname for the University of Nebraska athletic teams, "the Cornhuskers"). Husking corn was done by hand by early settlers of course (before the invention of husking machinery).